I often marvel at the skill it takes to ride a dirt bike. Take a moment to think about what the hands and feet must do. It’s a complex dance: left hand operates the clutch; right hand cops two simultaneous never-ending tasks - throttle and front brake; right foot has the rear brake and left foot the task of shifting up and down. No wonder beginners find dirt riding so challenging. For most dirt riders hands and arms are the weak link. Arm pump, cramp, and plain fatigue are all the result of the extreme stress dirt bike riding places on hands and arms. Getting your handlebars and body position right is the first step, and so too the controls must be properly set up and used to promote economical and relaxed operation. We start by ensuring a near straight line from shoulders through elbows (held high) and continuing through hands and levers, head and shoulders over the steering pivot. This gives the most power and economy and also allows you to grip the throttle well over the front, vital if you are ever going to get it right open. Now the grip: holding on with four fingers and thumb might feel secure, but it doesn’t allow your fingers to move fast enough to control the bike in high speed or technical going. One or two fingers must be on the clutch lever, ready to slip or pop the clutch, the expert’s secret performance weapon. At times expert riders might use all fingers on the throttle, but most of the time one or two fingers will be shadowing the front brake, ready to slow the bike as required, especially downhill and in slippery or technical conditions. Now that I’ve seemed to make hanging onto your beast even tougher, here’s a demon tip: keeping your head over the steering pivot while gripping the tank with the knees and bringing the thigh muscles into play allows you to relax those relatively weak hands and arms whenever possible. 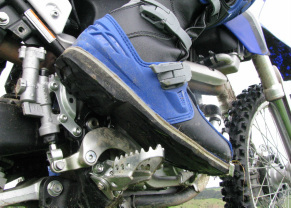 Most beginners have their brake pedals set for sitting only, but as we have discovered in part one of this series, standing, especially the standing attack position, takes precedence as this is the mode in which we tackle all the big business of dirt riding. It’s vital that the bike is set up so you can use the foot pedals fully while standing, in particular the rear brake, or while stretching way back on a downhill, or under severe braking, even if you cant rest your instep on the peg while braking seated. The gear lever must be set so you can slide your boot underneath to upshift, even when standing, the down side is that you may now have to lift your leg to upshift when sitting. 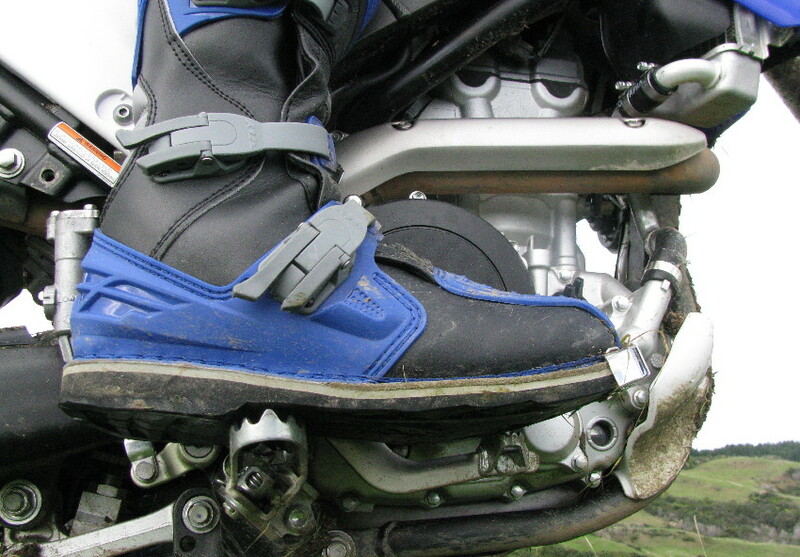 Again, get used to the idea that if downshifting while sitting, depending on the bike you ride and your boot size you may have to lift your foot up onto the gear lever and your instep might be clear of the peg. The final thing to work on is your foot position on the pegs. Varying your foot position from instep to balls gives your muscles a rest, some experts even say you have better control on the balls of your feet. On trails with many lurking stumps, rocks and roots, the splayed foot easily becomes a broken foot. In likely situations, ride on the balls of the feet. On flat ground, while sitting well forward on the seat with both feet on the pegs, ride a tight figure eight in first gear. Apply both brakes gently and slip the clutch against the brakes, engine revs just above idle. Keep your elbows up and lean the bike down, keep your head and shoulders over the steering pivot. Tighten the circles and ride as slowly as possible. Do this in both directions. When you are tired of this try standing on the pegs. Again move your shoulders over the steering pivot when standing, lean the bike into the turn placing all your weight on the outside peg, tighten up the turn, lean even more. Do this exercise. When you get it right try stopping momentarily and balance on the pegs at the apex of each turn, slipping the clutch against both brakes. Try this exercise often and when you get good at it try stopping on the apex of each loop. Keep it smooth with even revs and NO jerking.